The lore of jazz is filled with stories of musicians of prodigious gifts who appeared on the scene in a starburst and disappeared back to whence they came just as quickly; leaving behind perhaps a few recordings and the often faulty memories of those who worked with them. Pianist Jutta Hipp epitomizes these musicians. Ms. Hipp was born in Leipzig, Germany in 1925. She learned to play the piano as a child, but in the immediate aftermath of the Second World War she studied painting at the Leipzig Kunstakademie. By this time her interest in jazz had begun. When the Soviets took over what would become East Germany in the late ’40’s, she moved with her family to Munich. There, Jutta began to play piano professionally, starting her own group. In the early 50’s, she joined a group led by saxophonist Hans Koller. During her early days, Ms. Hipp copped to being influenced by great swing pianists, like Basie, Teddy Wilson and Fats Waller. However, by the time she reached Munich, she had heard Bud Powell and was fully in his thrall. There was also a bit of Lenny Tristano in her attack, although Ms. Hipp always brushed aside those comparisons. Jutta led her own quintet in Frankfurt in 1953-1955 and recorded for several labels, including a session that was later released by Blue Note. It was now time to come to America. 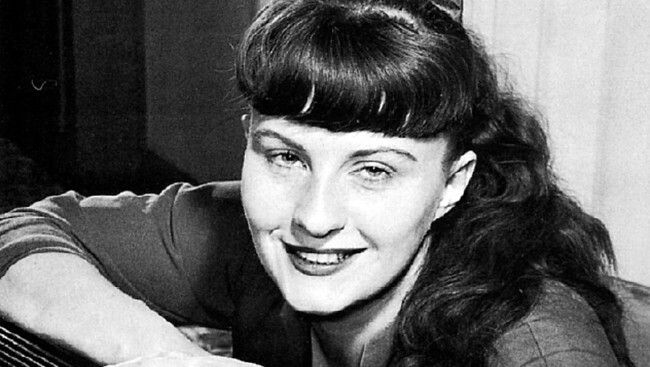 Jutta Hipp arrived in New York in November 1955. Her immigration to the United States was sponsored by jazz critic Leonard Feather who had discovered Hipp while visiting Germany and was “blown away” by her talent. Ms. Hipp played at the famous Hickory House for much of the first half of 1956 and within a few months, she became the first white female as well as the first European instrumentalist ever signed by Blue Note Records. Hipp cut three albums as leader for Blue Note in 1956. The first two of those were live trio albums recorded during her six month stint at the Hickory House, with British bassist Peter Ind and Ed Thigpen, known for his years with Oscar Peterson, on drums. Hipp was by now expressing a fondness for the blues drenched style of Horace Silver, which does show a bit on these first two records. The most famous of the Blue Note recordings featured the great tenorman Zoot Sims as a co-leader. Sims made a perfect musical partner for Hipp and they sound as if they had played together for years. On this record, the Silver influence had disappeared – in fact she seems to have developed her own ingratiating style, that is mature and swings hard. She followed this recording with a successful appearance at the 1956 Newport Jazz Festival and looked for all the world to be on her way. Unfortunately, the Sims album was Jutta Hipp’s last known recording. Two things served to scuttle her musical career. First, she suffered from stage fright. Playing in anything other than an intimate venue, before an appreciative crowd left her virtually paralyzed. This made bookings in large rooms and additional appearances at large festivals impossible. Second, she had no interest in recording music that she did not like. Feather tried to get her to record some of his songs in late ’56. Jutta refused, causing a permanent rift in their professional relationship, which, considering Feather’s influence in the jazz scene of the time, was not good for her career. By 1958, Jutta Hipp had left the jazz world for good. She never married. She remained in New York for the rest of her life; supporting herself as a seamstress at a factory in Queens. She painted scenes of street life in Queens. Hipp also was a fine photographer, who took many shots of her favorite Long Island beaches and of the musicians playing in the NYC and Long Island jazz clubs where she continued to attend concerts when the mood hit her. Such was her loss of contact with the music world, that Blue Note did not know where to send her royalty checks until 2000. Jutta Hipp died in her Queens apartment on April 7, 2003 of pancreatic cancer. She died without family or friends to help her. Shortly before her death, she had been discharged from the hospital into the care of some neighbors in her apartment building, one of whom was a nurse . She had insufficient funds for a burial or a funeral, and she willed her body to Columbia University, for scientific research. It was a sad and lonely end for a wonderful musician, whose talent had touched many during her brief period in the spotlight. This entry was posted on September 11, 2011 at 8:33 am and is filed under Unsung Women of Jazz with tags Blue Note Records, jazz, jutta hipp, zoot sims. You can follow any responses to this entry through the RSS 2.0 feed. You can leave a response, or trackback from your own site. By the way: Why naming just a “lane”, not a real “street” after her? They should also name a place, or a park after her. She loved nature. Her love to jazz started already during the 1930’s. She loved to listen to Thomas ‘Fats’ Waller, and to Jimmie Lunceford whose recordings were hard, but not impossible to get. Thank you for the additional information. It is truly appreciated. I look forward to the opportunity to read your book. As I was looking around im my favorite record shop a while ago, I discovered the Hipp/Sims cd for 5 Euro’s. I didn’t know Jutta, but Zoot Sims was a familiar enough name to buy the cd. What a surprise when I came home! Jutta’s playing is so disarming, it’s as if she barely touches the keys, her fingers dancing around lighthearted. Thanks for the information on Jutta, and thanks Katja for the additional info. Greetings from Belgium! There is a German radio portrait on Jutta Hipp. From what I could hear, her playing at “Hickory House” is far more secure than at the studio recordings with Zoot. She sounds a bit “restraint” there, compared to the ‘live’ recordings. I only have her CD with Zoot Sims plus her two hickory House recordings in the Peter Ind 4CD set, but I’ve ordered copies of some of her others: Cool Dogs and 2 Oranges, Frankfurt Special and Lost Tracks…Can’t Wait to get them in the mail. Germany should issue a stamp for her too sometime soon. She was SO great! Ich liebe dich, Jutta! !